Happy Bloggers Challenge Friday! Thanks to those who played along with last weeks Tag Challenge. This weeks challenge is For the Grad! I also wanted to let you know, in case you missed my RC Challenge post earlier this month, that the Challenge at the RC Blog this month is "celebrations", so if your "For the Grad" project also contains a "spooled" item, than be sure to link up here too, for a chance to win a Ribbon Carousel! 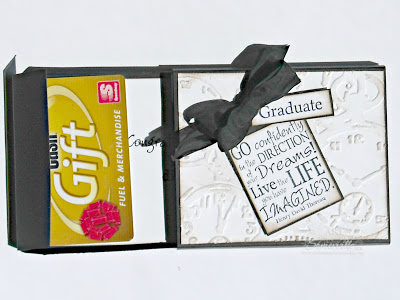 For my project, I created a Graduation Gift Card Holder - this is a sneak peek of my project for this month's Club CR8. I'll edit this post with a link once Club CR8 goes live! All stamps are from Our Daily Bread Designs Dreams stamp set. The top of the box is embossed with the Clock Embossing Folder, then lightly sponged. The sentiment is stamped in Ranger Black Archival, sponged and adhered to a tag that was die cut from Black card stock using the tag die from Our Daily Bread Designs Recipe Card and Tags Die. Our youngest son will be graduating from HS in two weeks! Today he came home and said, he only has 4 days left of school, and is finding it a bit strange, because for the last 12 years, this is all he's known, get up and go to school. While he has worked part time for the last year, he's right, he's gotten up and gone to school, and for four summers also took classes to get ahead. He did earn a Scholarship and is all registered for Fall classes at the local college! Here's a picture I took of Joe and my husband on Scholarship Night. Congratulations Joe, we are so proud of you! If you'd like to play along with this weeks Bloggers Challenge, please link back to this post on your blog and mention you created your card for the Bloggers Challenge For the GradChallenge. Please add your link using the Link Tool below, your link should be a direct link to your Bloggers Challenge Post, use your name as the Title. Please do not link to cards that were created prior to the challenge date. Entries not linking properly, or backlinked will be removed. If you have the captcha enabled on your blog, please consider turning it off, as it makes it so much easier to leave comments. What a great gift card holder design! Congrats to Joe on his achievements! Fabulous gift card holder and great idea. You must be so proud! Congrats to all! Enjoy the weekend! 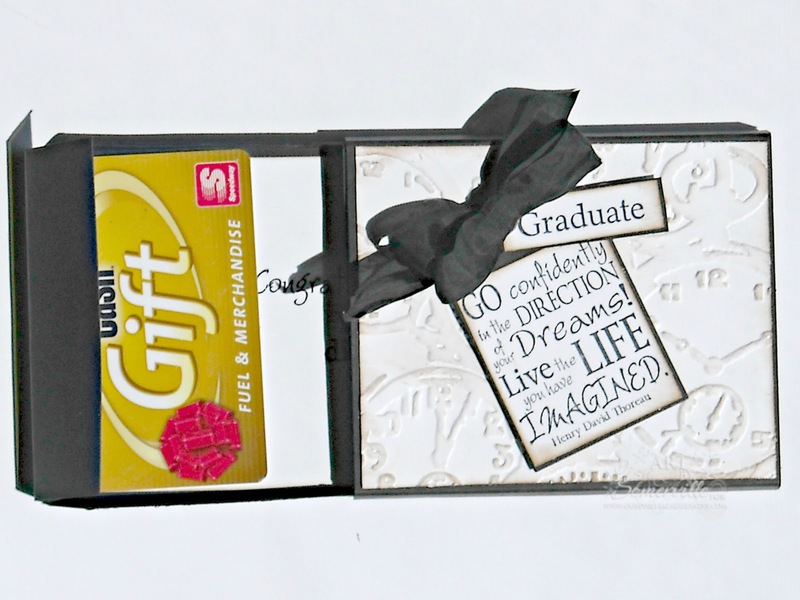 Your gift card holder is a great graduation card idea. Congratulations to Joe and to Mom and Dad. What a great achievement! Very cre8tive little box/gc holder there GF! Love the stamps you used. Never thought about that, yes...it's always been about school. 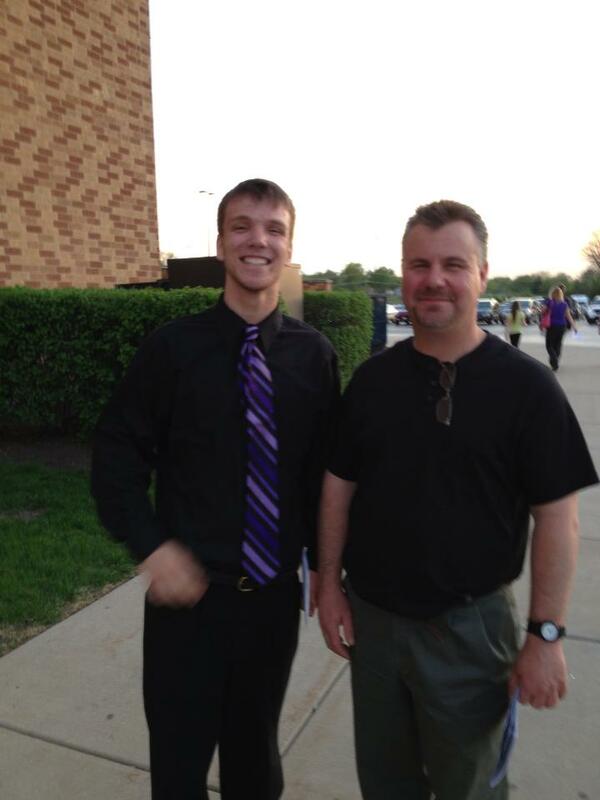 Proud of him, great pic of him and Dad. Way to go Joe!